We can't help it if we made THE BEST !!! 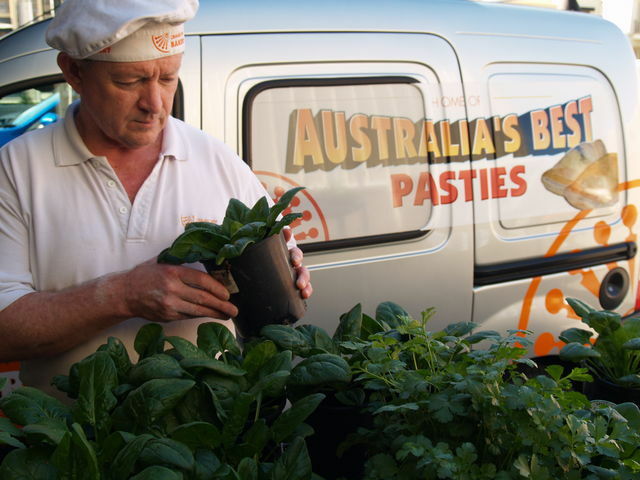 On May 27th,2014 the Orange Spot Bakery won Australia's Best Plain Pasties at 'The Great Aussie Pasty Competition', held in Sydney at the Food Service Expo, Moore Park. This is the 5th consecutive year that the Orange Spot Team have taken out this prestigious National Baking Competition and the 6th time since 2005. The Orange Spot took out 1st place in the plain pasty with an unprecedented perfect score of 50 out of 50 for the plain pasty and so now are the true KINGS of the everyday must have lunch time favourite the plain Pasty in Australia. The Best Apprentice Pasty Maker title was also won by Apprentice baker Matthew Williams. Congrat's Matt. Come down to the Bay and see The Orange Spot Bakery's new Café. Enjoy sitting by the fire in winter eating a Great Pasty or bask in the sunshine in summer with the open outdoor seating. If you haven't enjoyed the new café with great coffee and cake we look forward to your visit next time you are in Glenelg or pop down for a taste of the best you can get in Australia just for the heck of it. Nick, Margaret & Jayme Davey along with their extended family and great staff look forward to seeing you soon. A True South Aussie Family Business Doing It Best. pasties... pasties... and more pasties... 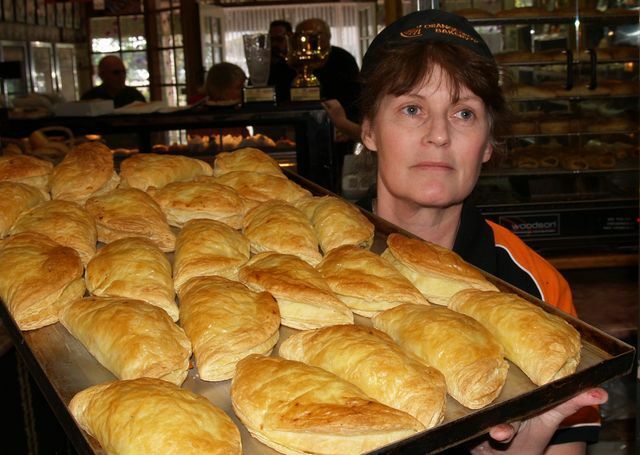 Since the big win in Sydney as 2010 Home of Australia's Best Pasties The Orange Spot bakery has worked around the clock to produce double their normal pasty numbers. Nick takes pride in his blooming herb garden. All the Orange Spot's savoury products have our freshly grown herbs to flavour them. This ensures that you get only the freshest flavours. The new water tanks now feed the staff amenities. Reducing the amount ofmains water used by 37,000 litres per year. Since 2003 we have more than doubled our turnover whilst our total water usage has decreasedfrom262KL per quarter to just 49KL per quater n 2010. All packaging has been replaced with recycled paper. No plastic carry bags are used. The preferrred suppliers to The Orange Spot Bakery are those that use 'E-Invoicing',reducing the amount of paper coming through the back door. The bakery floor is in the process of being refurbished. This will mean that the bakery can change the way they clean and at the same time reduce the amount of water used for cleaning by a massive 30,000 litres per year.Along with bio-degradable cleaning chemicals this is a majorchange to the everyday cleaning needs of the bakery. Reduction to co-mingled waste has been a massive 50% so far, with the introduction of paper & cardboard recycling, plastic recycling and food scraps collected daily to be used in the feed process of farmed pigs. Some good and hungry worms in the new worm farm, currently consume green waste and then the liquid by-product and casings are used to ferilize The Orange Spot's new herb garden. Yes fresh herbs are used in the bakery products so only the best ingredients are taken from nature to you. The bakery only uses recycled toilet paper, paper hand towels & bio-degradable garbage bags. All paper used by the accounts team for hard copy is recycled paper. The Orange Spot Bakery are committed to reducing their carbon emissions by adopting a plan of pouring profits back into infrastructure to ensure they offset their carbon footprint whenever possible. The team at The Orange Spot have commenced this challenge to clean up their act. So when you buy your baked goods at the SPOT you will be helping to save our planet!!! The Orange Spot Has expanded into a fabulous new bakery/café with open fireplace in winter to warm your toes while eating Australia's Best Plain Pasty and Gold medal winning gourmet and vegetarian pasties in the open air windows for enjoying the summer days while sipping your great coffee. Once you've tasted Orange Spot Baked Goods you'll never look at another. We hope to see you one day at the Orange Spot. Our shop is open Monday to Friday 7.00am to 4.30pm. Saturday, Sunday and Public Holidays from 7.00am to 4.30pm. Looking for a great day out... Head for the sea at Glenelg and pop into The Orange Spot Bakery for lunch. HAVE A GREAT DAY... EAT A DONUT..
margaret had a great time with the French Bakers and visited many small businesses who were very happy for her to come along and work beside them during a typical day in the life of a french baker. 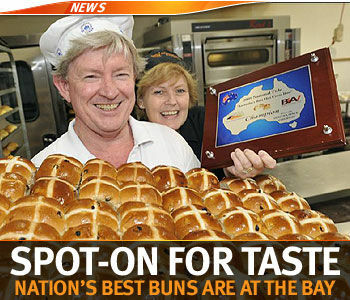 Yes the Best Hot X Buns in the land. Try them this Easter. You'll be counting the days until next Easter after you have tried these buns.